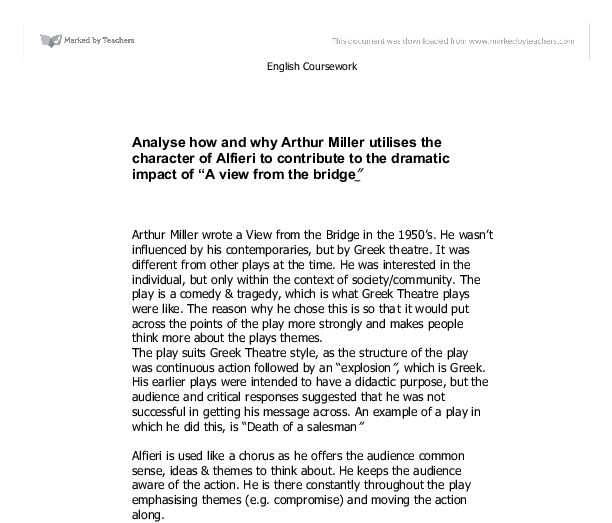 Analyse how and why Arthur Miller utilises the character of Alfieri to contribute to the dramatic impact of "A view from the bridge" Arthur Miller wrote a View from the Bridge in the 1950's. He wasn't influenced by his contemporaries, but by Greek theatre. It was different from other plays at the time. He was interested in the individual, but only within the context of society/community. The play is a comedy & tragedy, which is what Greek Theatre plays were like. The reason why he chose this is so that it would put across the points of the play more strongly and makes people think more about the plays themes. The play suits Greek Theatre style, as the structure of the play was continuous action followed by an "explosion", which is Greek. His earlier plays were intended to have a didactic purpose, but the audience and critical responses suggested that he was not successful in getting his message across. 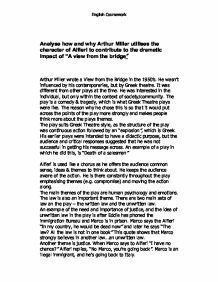 An example of a play in which he did this, is "Death of a salesman" Alfieri is used like a chorus as he offers the audience common sense, ideas & themes to think about. He keeps the audience aware of the action. ...read more. He speaks to him as a friend and lawyer. His friendship with him allows the audience to understand Eddie more. But Alfieri plays both parts well - he is honest with Eddie when telling him he can't help any more than he has. At the end of the play, we find out that Alfieri admired Eddie for standing up for himself and not compromising and doing things his own way. As a narrator, he's involved in the action of the play, acting as a go-between. He tells us of what's happening in the pay, and draws out the significance of the events going on, for example by introducing the time and places and characters. Miller uses Alfieri to say what he thinks. He sums up the scenes, and is a sage. He makes the themes of the play explicit, and creates a connection between the characters and the audience. He also predicts the future saying how he thinks things will happen. He could be seen as the character with the view from the bridge, looking over the action of the play. The dramatic impact of the play involved Catherine & Eddie's relationship. ...read more. The first speech emphasises his distance from the other characters, when he says, "You see how uneasily they nod at me?" this shows that he isn't too popular because of him being a lawyer, and seeing a lawyer in the street is known as unlucky. He says how he is important, but not very powerful and things wont change in the sense of problems. Lawyers cannot change what's going on, only help things move along. The last two lines of his speech, he says "and sat there as powerless as I, and watched it run its bloody course" this tells us how the play ends in tragedy. Alfieri making his last speech drawing out the ideas of the play ends the play. He tells us how "it's better to settle for half". This has the idea of compromise and having to settle for less to make more peace. Eddie didn't settle for half, he did things his own way and it lead to him having a useless death. Alfieri was an important part of the play, without him the audience would be clueless as to some of the events going on. He was effectively used throughout the play, as a narrator and character. The audience is presented with themes and ideas, which Alfieri offers them to think about. English Coursework ...read more. Eddie never sits down and discuses with himself what course of action he should take or even why he is acting the way he is acting the way he dose, he simply dose things because he is a man and he thinks men should not talk about their feelings. I mean it! I'll up the whole house! I'll buy a rug!" The clothes she wears in the beginning are attractive, and Eddie does not like this. Because Catherine respects Eddie's wishes, she does not wear the clothes. So, in the beginning of the play, she would be wearing not so attractive clothes. No, I-I'm tired." Eddie is jealous of Rodolpho in more than one way, he feels undermined by Rodolpho's talents, cooking, dress making, singing. Even though he uses them as something to attack him with, he secretly feels that Rodolpho can do more than him and can go further in life than he ever will. Arthur Miller was called to testify in front of the House Un-American Activities Committee to name names of communist sympathizers in 1956, the height of the McCarthy Era. Miller refused to do so and was praised by the community for his strength of conviction and loyalty. 'You see how uneasily they look at me? That is because I'm a lawyer. In this neighbourhood to meet a lawyer or a priest on the street is unlucky.' We then told about his arrival to Redhook 'I only came here when I was twenty-five,' but learn that he was born in Italy. However, with the amalgamation of the American and Italian communities, this custom of having prior family approval of suitors, is no longer necessary and therefore the Italian community does not support Eddie in his opinions.